The ingredients of the stuffing are make the Kachori mouth-watering and addictive. It is actually simple to prepare; in my opinion this crispy, slightly spicy dish could be a real ” GiftJaipur only delivers products made in Desi Ghee. 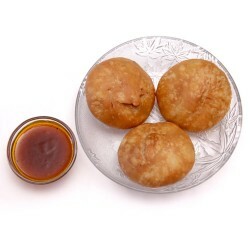 To send these Kachori, minimum amount of your order should be of 300 Rs.